Marcelle New-Age Precision Anti-Wrinkle + Firming Eye + Lip Contour Cream helps reduce the appearance of wrinkles, fine lines and crow's feet while preventing the formation of more of the same. It relaxes the muscles beneath the skin around the eyes and lips for a smooth and soft skin. Now with Matrixyl® Synthe’6, a powerful peptide that reinforces and firms the skin and reduces the appearance of wrinkles. Hypo-allergenic and perfume free. Ideal for all skin types. 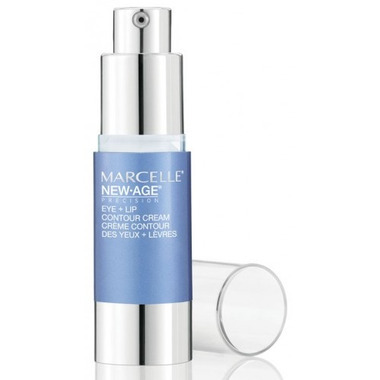 I am pleasantly surprised by this Marcelle product. Lately I've been turning to more luxury brands because my eye area seemed to have lost its elasticity over night. But I decided to pick this up one day as it was on sale and figured I had nothing to lose. I was so impressed. It is quite moisturizing but still light (have to watch out for very thick products causig milia). This is the first eye cream I grab in the morning and I leave my thicker creams for at night. I really do love it as my datime cream...makeup lays so nicely above it. I do need a heavier duty cream at night since my undereyes are so dry, but this cream has won my heart for daytime use. I liked easy to apply lotion, the first couple times, it felt a little hot after application, but my skin seems to have adapted. I really like it. I've used this for years now, during the day under makeup (nighttime I use a Derma E peptide eye creme) and this works really well for me. I'm 44 and have NO crowsfeet whatsoever and I think it's in part due to this. Love it! Being that this is my first experience with eye cream I was expecting it to behave like every other face cream but it doesn't. When you first dab it on it definitely has a bit of a bite to it. Then after you've dabbed it all around your eyes, for me at least it takes a good 20 min to absorb fully into the skin which is a bit of a pain because you can't put any eye makeup on while its just sitting there on top of my skin. That said the bags under my eyes, though small to begin with seem to be disappearing which is the point as far as I know so I would recommend it.